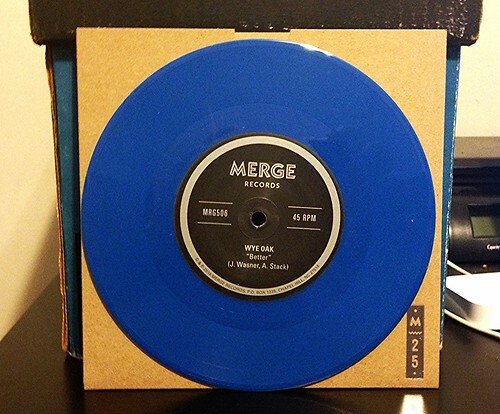 The Or Thousand Of Prizes singles club from Merge rolls into June with a split 7" offering from Wye Oak and Telekinesis. Merge has been very timely with these records. I don't want to jinx it, but so far this is the best, most consistent roll out of a singles club that I've ever seen. Hopefully they keep on going strong. Musically, I can't say the series has been as consistent for me. Wye Oak employs a clean guitar sound with some electronica and ambient sound effects. High pitched, other worldly vocals glide over top. There's a few Beck songs that have a similar flair, but those were always the Beck songs that came off as a bit pretentious to me. Wye Oak sure sounds like they are trying to be important and artistic, but to me it just comes off as being boring. "Better" kind of reminds me of "Chariots Of Fire" or some other pseudo-inspirational schlock befitting a slow motion scene in a movie. There's a somewhat interesting moment towards the middle where Wye Oak indulges in a louder, synth driven solo; but it immediately reverts back to being boring again to close out the song. Telekinesis, on the other hand, are much more exciting. Building off of a loud, crunchy guitar with a hooky verse and strong vocals that don't rely on fuzz or other trickery (though there is a slight echo on the chorus). I can't say that I was really familiar with this band, but I'm pretty impressed with this song. Though I could not in good conscious say they are as good as Mikal Cronin, I feel like Telekinesis is aiming for a similar place. Worth checking out.